Environmental network Saving Iceland declares full solidarity with the Reykjavik Nine defendants (RVK9), who face between one and sixteen years in prison for exercising their democratic right to peacefully protest against a disgraced parliament, on 8 December 2008. Criminalizing political opponents, even those who use non-violent civil disobedience, is an old diversion tactic used by states worldwide. This act of political repression is in glaring contradiction to the sanctimonious declarations of ‘shouldering responsibility’ and ‘taking heed of lessons’ paid by the parties responsible for the crisis. Icelanders should take seriously the systematic abuse of power which has been uncovered in the Icelandic establishment. So far not one individual from the political or financial community, many of whom have been identified from all sides as the culprits of the crisis, has been tried in Icelandic courts. That the young people of the RVK9 are to be the first individuals to be tried as a result of the crisis speaks clearly for the climate of denial that now pervades the atmosphere in Icelandic society, and for the scandalous reluctance of the Icelandic state and its political class to take responsibility or draw lessons from the crisis. Saving Iceland would like to call the urgent attention of international human rights and civil liberties NGOs to the attack on the legislated rights of protestors in Iceland. These rights are both constitutionally and internationally legislated. Even though the offices of parliament were recently discovered responsible for pursuing and pressing charges against the RVK9, the president of the parliament has claimed that the RVK9 case is out of the hands of the executive power and now in the ‘safe’ hands of the legislative power. What irony! Every Icelander knows that in Iceland there is still no clear division between the executive and legislative power. This is in keeping with the frequent accusations that Iceland is but a ‘banana republic’. It is still the case that the Icelandic courts (municipal and high) have been rigged systematically by cronies of the Conservative party. The legislative system in Iceland is just as discredited as the political establishment and financial sectors. One must deduce that the chaos that has so far followed each RVK9 hearing, including even a riot scenario, has been allowed to escalate to such an extent as part of a deliberate and cynical attempt by the establishment to provide a politically destabilizing and unfavorable presentation of the defendants. The extensive errors of judgement displayed by the judge have simply increased tensions and further contributed to the farcical nature of the proceedings. This is evident in the way that the still neoliberal media has persistently presented the case. The Icelandic media has repeatedly called for heavy sentences of the defendants and consistently declared their guilt as self evident. This has gone so far that one lawyer, Ragnar Adalsteinsson, has declared that the RVK9 have no chance of receiving a fair trial. When the national broadcasting agency finally gained access to and televised CCTV footage of the defendants entering parliament, it became clear that the charges of violence and bodily harm to parliament staff were entirely unfounded. 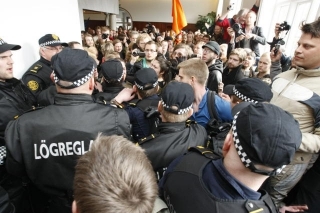 One of the main arguments that the Icelandic media has pursued against the defendants was that they had introduced a culture of violence into Icelandic protests and therefore had to be dealt with in a severe manner. In spite of the case’s high prominence, the presentation on national TV of irrefutable evidence which exposes the charges of violence as base lies, was met with stony silence by the rest of the Icelandic media. This is a glaring example of the reluctance of Iceland’s media (itself severely reprimanded by the SIC as willing servants of those responsible for the crisis) to learn its lessons and shoulder responsibility for years of negating the democratic ethos of journalism. We would also call to attention the vindictive motivation of the charges against the RVK9. It is reinforced by the fact that the supposedly centre-left Peoples Alliance party, which leads the present government, shared power with the Conservative party in the government which was overthrown by the protest movement. Within the present ‘left wing’ government, the vindictiveness of the previous two parties is catered for by the persistence of charges against the RVK9. Clearly the Left-Green party, which attained power as a consequence of the protest movement and now shares leadership with PA, will not seriously pressurize their coalition partner to withdraw the charges. It looks as if the protestors are being sacrificed in order to pacify those squirming in the international spotlight for their responsibility in generating the crisis. This amounts to a total betrayal of the call for greater democracy and ethical politics whose demand swept the Left-Greens to power in 2009. As stated, Saving Iceland are in complete solidarity with the RVK9, and also their families. Individuals in the Saving Iceland network are no strangers to the feelings of criminalization and being dragged through the courts, on trumped up charges, for acts of non-violent civil disobedience. We have learned that it is one of the underlying aims of the state to use such court cases to disrupt our lives and those of our loved ones by maintaining an extended shadow on our future. This is a deliberate and systematically employed tactic aimed at choking our voices and spirits. It is crucial that society identifies this state tactic of persecuting political opponents through criminalization as the cynical political repression that it truly is. The act of the RVK9 against the parliament of Iceland on 8 December 2008 focused the public protests against the corrupt government and significantly contributed to its downfall. This fact alone should persuade the Icelandic people that they ought to be grateful for the courage displayed by the RVK9; that they should oppose the RVK9’s being dragged through lengthy court cases and possible prison sentences. Thus we call on the people in Iceland to actively support the defendants and to stop the disgraceful violation of justice that this case constitutes. Saving Iceland is also compelled to call for urgent scrutiny and intervention into Icelandic affairs by the international community and NGOs concerned with civil liberties and human rights. Finally, Saving Iceland demands the immediate withdrawal of the charges against the RVK9 and, further, that the Icelandic parliament and State should issue an official apology to the defendants and their families for this act of sheer political repression. Ólafur Páll Sigurdsson is a poet, film-maker and literary scholar. He founded the Saving Iceland network in 2004.